This Sunday could turn out to be a crucial moment in Santiago Solari's hopes of staying on as Real Madrid's first team coach. His side take on Celta Vigo, in Vigo, and we're at the point where Florentino Perez and company said they'd make their decision on who would replace Julen Lopetegui. So far Solari has taken change of one Copa del Rey match, one in LaLiga and another in the Champions League. He's come away with three victories, 11 goals scored and none against. He couldn't have asked for a better debut as his heavily rotated side crushed Melilla 4-0 in the Copa del Rey. A 2-0 victory over high-flying Real Valladolid in LaLiga saw Madrid begin to look up as opposed to over their shoulder. The last match was in the Champions League where Madrid ran out 5-0 winners against Viktoria Plzen. The game against Celta could also be Solari's last in the dugout. As per the rules in Spanish football, an interim coach is only allowed to be in charge for 15 days and afterwards a decision must be made. 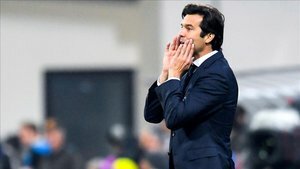 According to Deportes COPE's Melchor Ruiz, bar a disasterous showing in Vigo, Solari will be handed control of the first team until the end of the season. The Real Madrid board of directors are happy with the upturn in results, style of play and how the squad has responded to the appointment. Unlike the previously rumoured man to take over, Antonio Conte, Solari has the full backing from the players at his disposal.